Surrounded by amazing coasts, most of Kefalonia beaches have been awarded the Blue Flag for their cleanliness. The most famous beach is Myrtos, which is considered among the most impressive coasts in the Mediterranean Sea. Other gorgeous beaches in Kefalonia are Antisamos, Lourdas, Skala, Xi and Makris Gialos. Kefalonia beaches can be both organized or totally secluded. You will find below a list with the best beaches in Kefalonia island. Discover our guide to 36 beautiful Kefalonia beaches. They are all presented with detailed description, photos and their location on a map of Kefalonia. For the most popular spots, we also provide information about sightseeing in the area, a selection of hotels and reviews. Description: Platis Gialos is one of the most popular beaches on the island, close to the capital village and the busy resort of Lassi. It has golden sand and many watersports centres. Description: This is a beautiful beach that reminds a lot the bay of Myrtos, the most famous beach on Kefalonia. It is located in the peninsula of Lixouri, on the western side of the island. 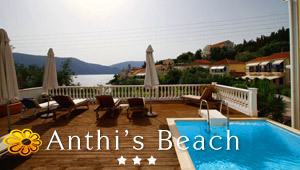 Description: Xi is one of the most beautiful and popular beaches of Kefalonia. It is very large, sandy and organized with umbrellas and sun beds. Description: Trapezaki is a small beach with calm ambience. It is organized and close to the beach resorts of Lourdata and Pesada.